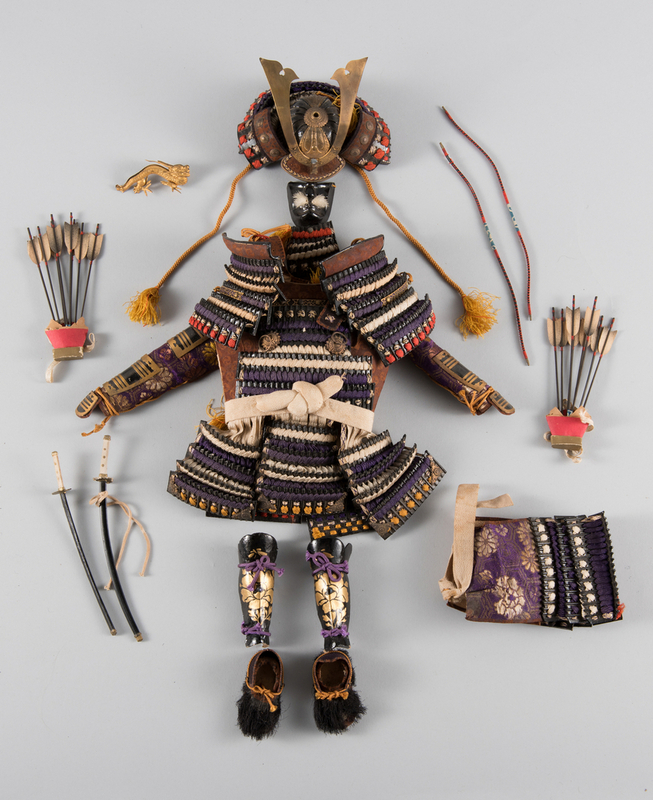 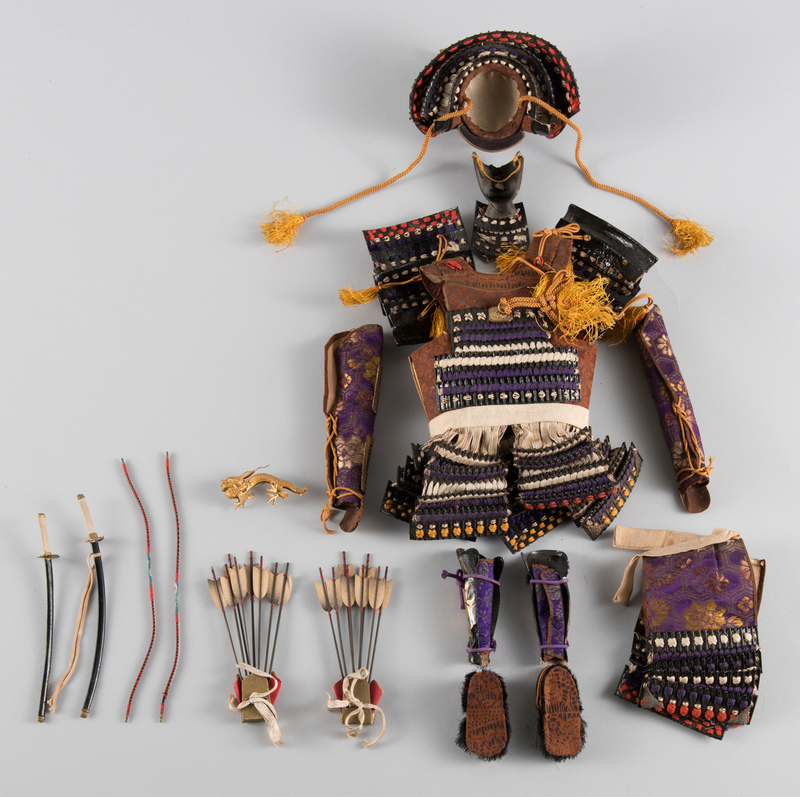 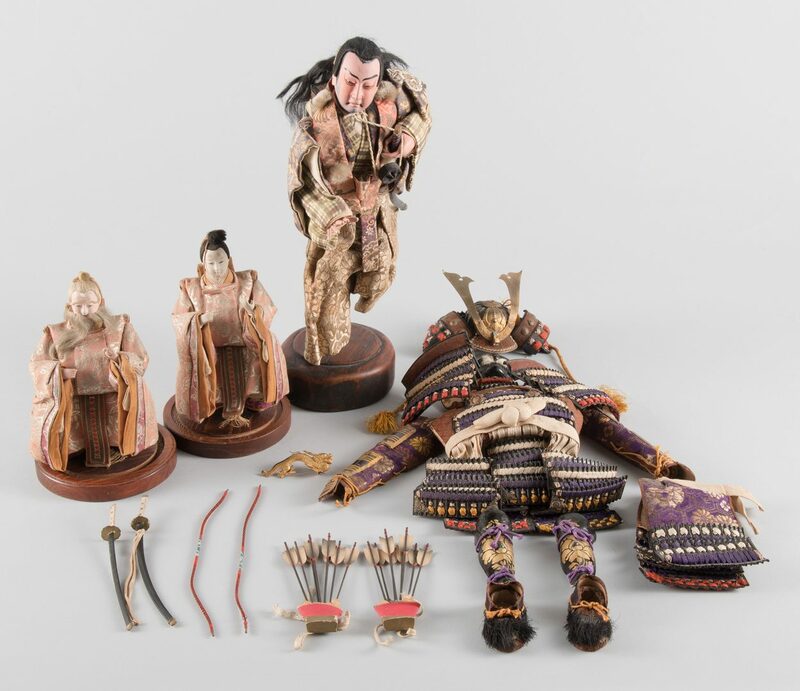 1st item: Japanese Kabuki Theater Warrior doll, painted composite figure, wearing silk robes and Samurai Sword, with additional elaborate and finely detailed silk and leather warrior costume including brass and leather helmet, quiver with arrows and painted shin guards, shoes and additional sword with gilt dragon. 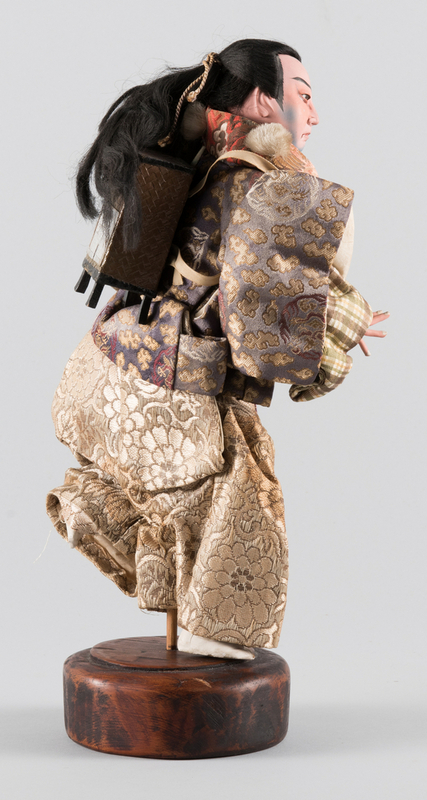 Doll 13" H. Comes with a custom wood and glass octagonal showcase approx. 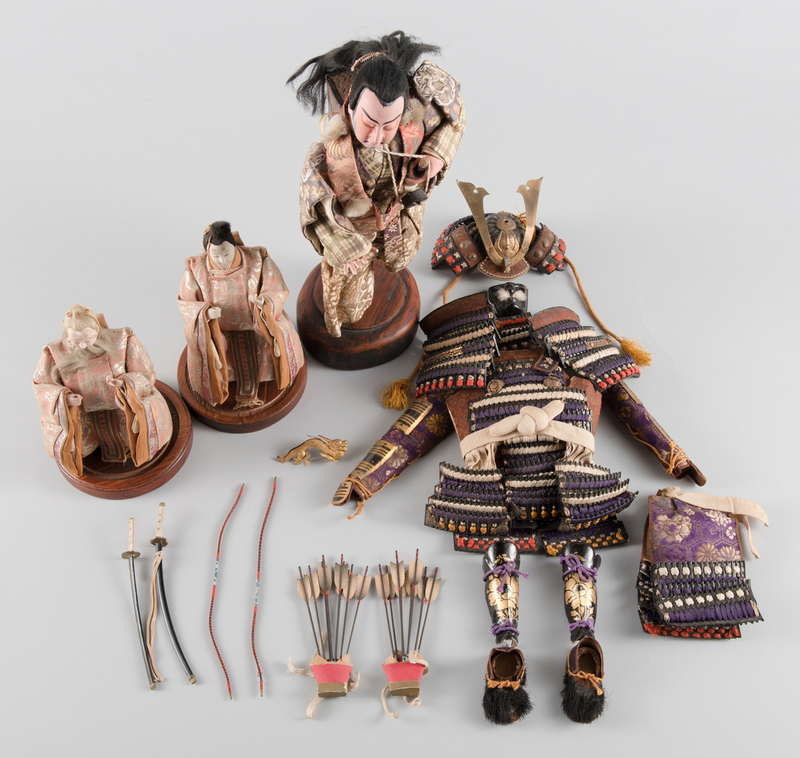 20" H, possibly original, which can be disassembled for shipping. 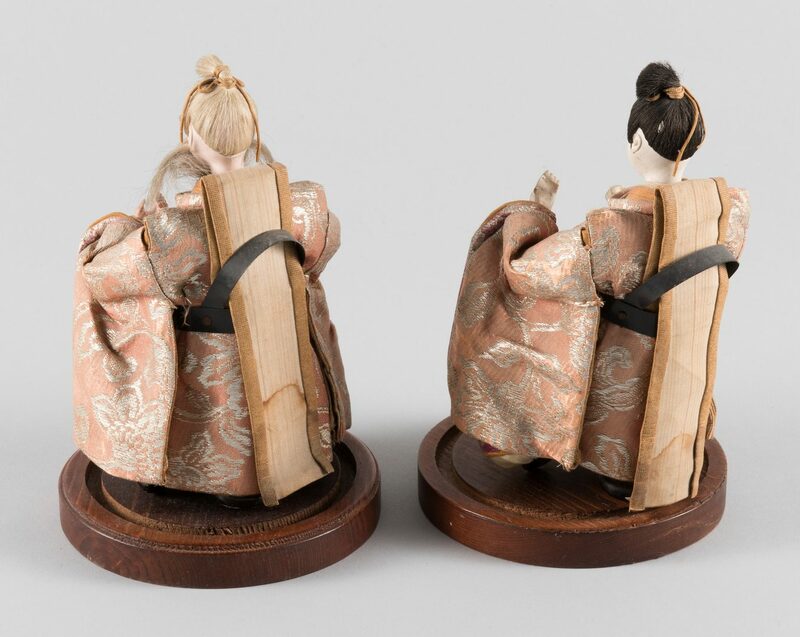 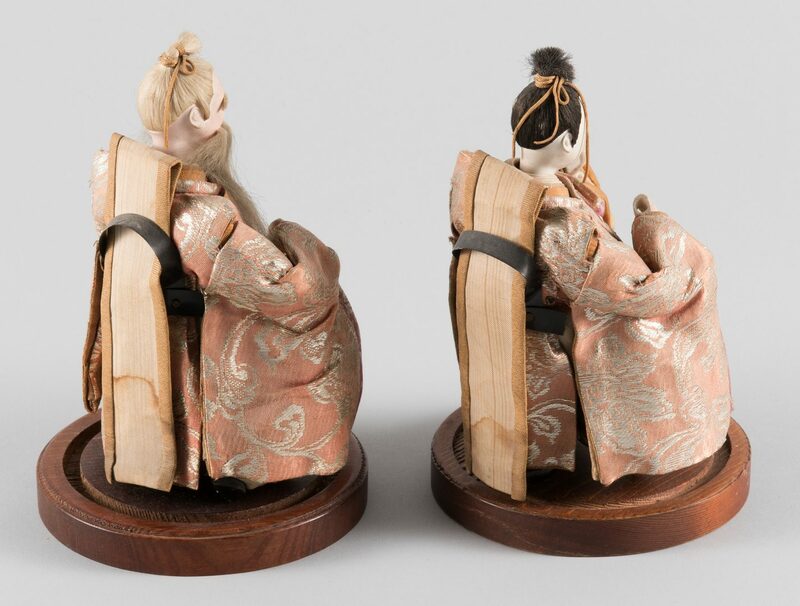 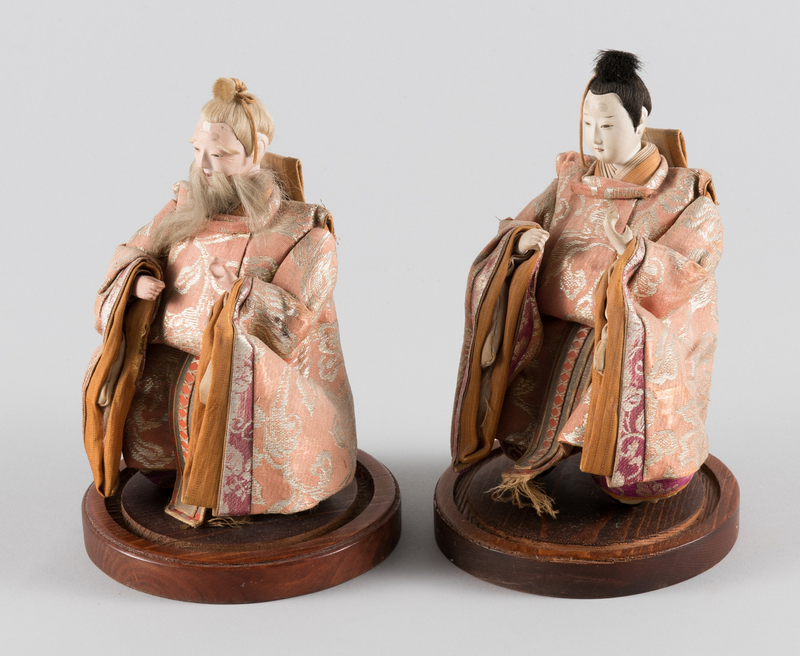 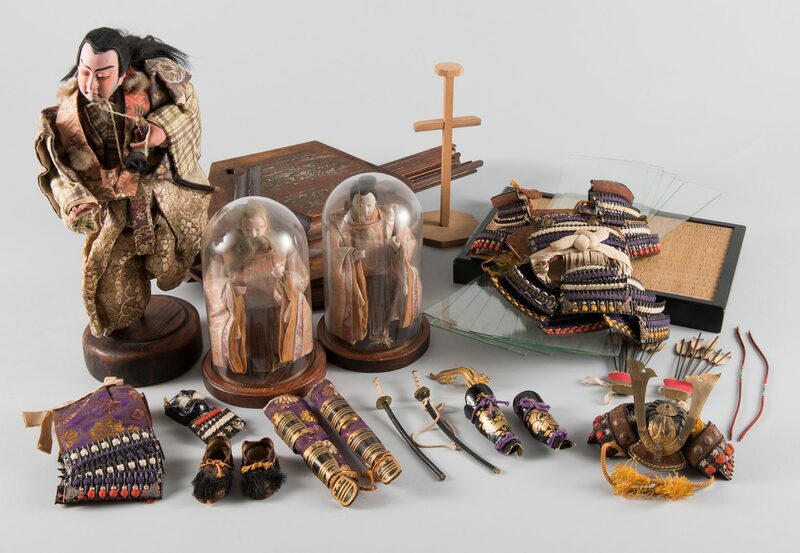 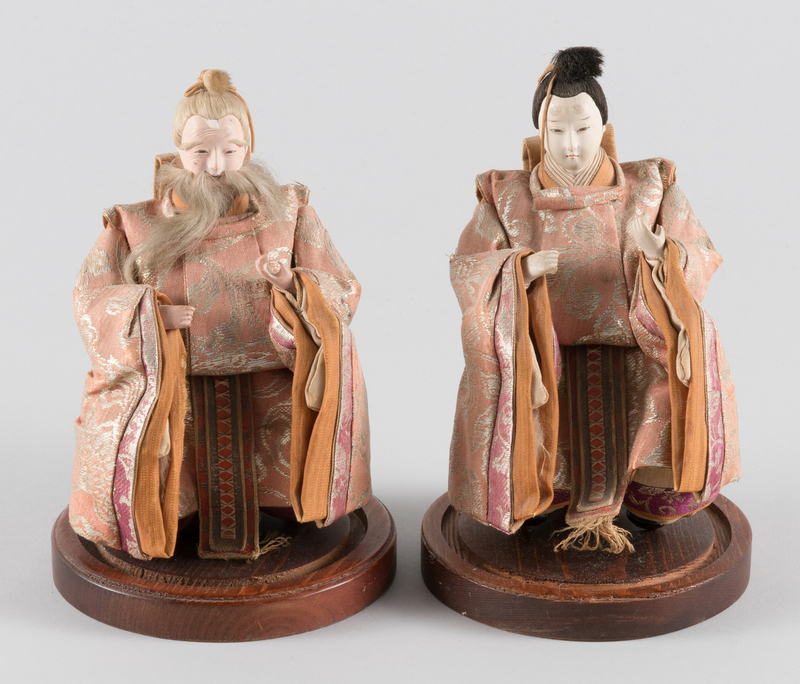 2nd and 3rd item: Emperor and Empress festival doll figures, with painted composite faces and finely detailed silk robes and fringed sashes, 6 1/2" H, each housed in a glass dome with removable wood stand, 7 1/2" H. All Meiji period, Circa 1900-1910. 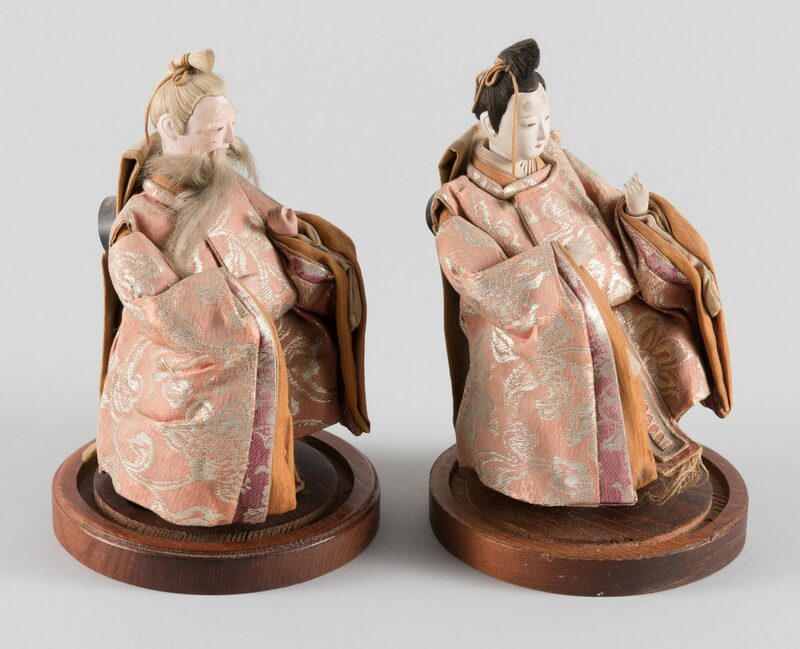 Provenance: Private Nashville collection; acquired by consignor's parents-in-law while they were working in Japan shortly after World War II. 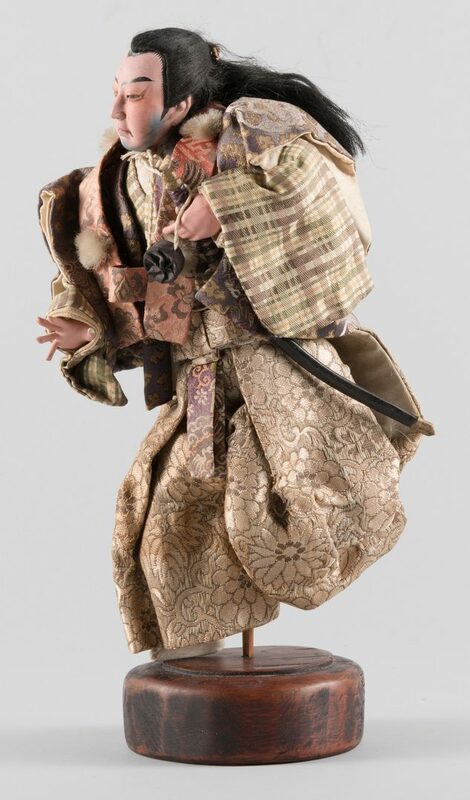 CONDITION: Kabuki doll: light grime and scratch to face, 2 fingers re-glued, one finger chipped; other hand has small hairline, both legs with hairlines, one foot reglued and the other chipped; costumes in good condition. 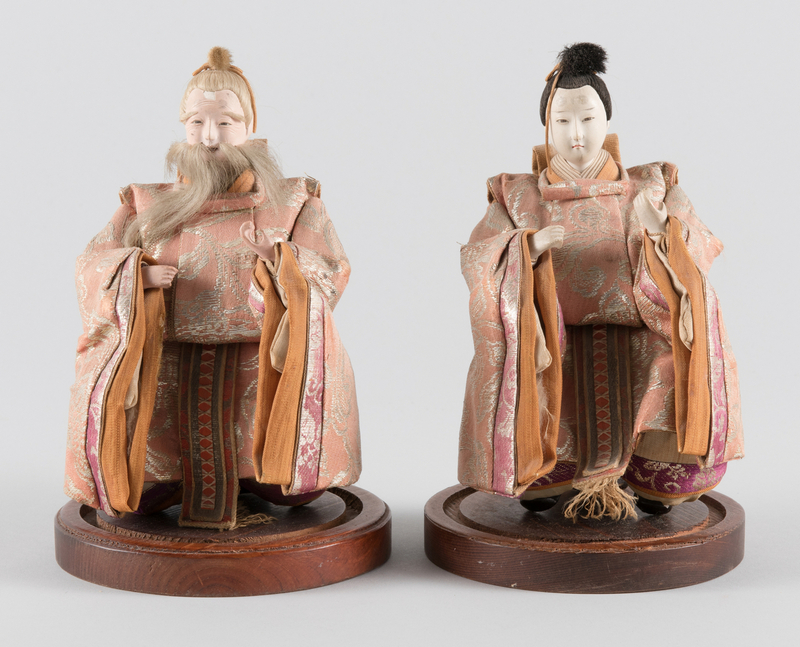 Emperor and Empress Dolls: Emperor has 1/4" chip to head, both dolls with fine hairlines to head, light wear and fading to robes, some chipping to paint on feet. 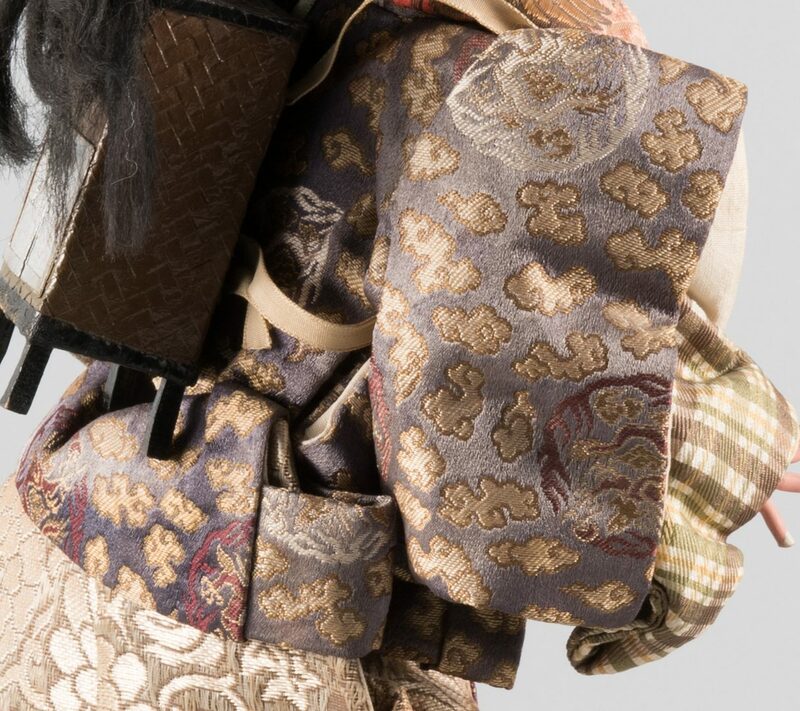 One glass dome with break to lower half.